I love this stuff. We have an older dog that can't hold his bladder sometimes and it is the only stuff I have found that gets that terrible smell out of the carpet! I have tried shampooers, several different times of spot cleaners and this is the only stuff that I have found that does the trick. I heard of the product through a friend that cleans houses and I would definitely recommend it to everyone! This is by far the best stain cleaner! I have used it on everything in my house including a beadspread that does not fit in my washer. I use it in the car too for the carpets and the fabric seats. Great price too! Have used this product for years and loved it, until recently. the can I have now left my carpet with light spots and I found out my daughter in-law in another state had the same problem. I am afraid to use it again. Temporarily cleans spots, but they keep coming back. I started using Spot Shot a few years ago to get rid of new spots on my carpet. At first, I loved the product. It was easy to use, and the spots went away very quickly. But over time, the spots gradually start to reappear. This isn't due to wicking. The stains are only on the surface of the carpet. I suspect Spot Shot leaves an oily residue in the carpet, and dust gradually starts sticking to it. I've had professional cleaners come in and steam clean my carpet, which removes the spots again, but they keep coming back. I haven't yet figured out how to get rid of them. This is a wonderful product to have on hand if you have carpet flooring throughout your home. 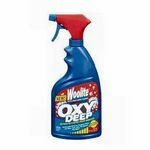 I have used this product to remove dirt and grass stains from my carpet. I have also used this product to remove cat urine from my carpet as well. I own two cats and there are times when my cats will accidentally urinate on my carpet. Spot Shot Instant Carpet Stain Remover also removed food stains from my carpet such as pasta sauce, mustard, ketchup and spilled drinks. Not only does this product work on carpet flooring, it also remove stains from sofas and chairs made from cloth material. The scent of this product can be a bit strong but once it dries the smell goes away. On the front of the can it states no scrubbing is required. I usually like to take a fresh cleaning towel and lightly scrub the stained area to insure the product clean deep down. This truly is one of the best carpet cleaning products I have used. 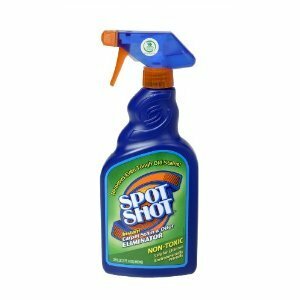 I bought Spot Shot Carpet Stain & Odor Eliminator a while back and wasn't overly impressed with it. It's not horrible but it's not great. It's just kid of an average carpet cleaner with an okay scent. 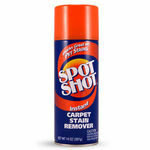 Spot Shot Carpet Stain & Odor Eliminator is fairly cheap so it's worth trying or at least having around as a backup. You use this like any other carpet cleaner, spray the spot, let it sit for a little bit, then rub on the spot. My problem with this product is it only works on the exact spot that you spray. So if you have a big stain you want to clean you have to spray a ton of cleaner, it's not only time consuming but uses up a bunch of the product! With a little bit of rubbing the stain comes right up. It's worked on coffee, marinara sauce, and dark soda that I got on my light carpet. The scent of the spray is fairly pleasant and doesn't smell super chemical like. I recommend this carpet cleaner the downside is that you either have to use a lot of it if you have a large stain or just keep it around for small stains. It takes care of stains pretty well though. Best product of its kind i've ever used! Before trying Spot Shot i had used numerous other products claiming to do the job. None worked 100% effectively. Then I had a coupon for Spot Shot. It was a miracle. Quick, easy, no residue, just use a paper towel to blot up and throw away. Keep can by my chair for coffee,beverage and food spills and never disappointed. I have numerous cans positioned in rooms all over the house for quick access. Works in car too. I never fail to recommend when I see someone debating about what to buy in supermarket or big box store. I've only used this product on carpet so my review reflects my use of it there. Overall I'd say this is a decent spot cleaner for the carpet. I have a cat the gets sick a lot on our carpet and unfortunately my fiancé is horrible at cleaning things. His idea of cleaning is wiping with a paper towel and that's it! So, I end up with stains in the carpet when it happens in rooms with dull lighting or rooms I don't get into often. 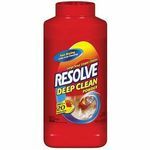 This is one of the cleaners I've used to get the stains out and it does an amazing job! It's like the stains were never there in the first place. For food stains, it just depends what the spill is and how long it's set in for. Most things it gets the stains out, there are some red drink stains that were set for a longer period of time that it won't remove. Same with ink/marker stains, my nephew decided my carper would be a good back drop for his pictures and has (more than one time) "colored" on my carpet. This product gets some of the lighter colors out but most of them it kind of just spread the color around so it wasn't bold lines but smudges. Either way, not the best. But like I said in the beginning, for the every day stains it does pretty good, great with most foods, dirt, etc. Scent It mostly just smells like a cleaning agent, which to me isn't great, but it's not off putting either.